Over the past five years, new printing technology has been radically changing how signs and banners are printed. 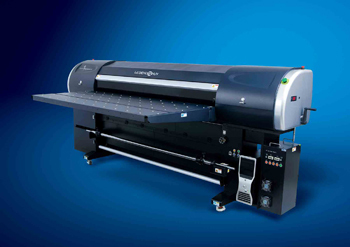 Wide Format, UV Curable flatbed printers have rapidly improved in print quality, capacity and reliability. The Legend 72 HUV is the most flexible wide format UV curable flatbed printer on the market. Built for heavy duty print shop use, the Legend 72 HUV is equipped for both flatbed and roll feed printing, making it perfect for signs and banners that need to be printed on rigid media as well as cloth, paper and vinyl. The Legend HUV can print up to 72 inches wide by almost any length. UV-curable printing is a great way to print long-lasting banners where outdoor exposure would lead many solvent and aqueous inks to prematurely fade. UV-curable inks are quite resistant to fading outdoors, have no need for lamination to protect the graphic, and do not weaken the substrate like solvents do. The Legend can print on vinyl, polyester film, polycarbonate film, backlit film, polystyrene, foamboard, acrylic, Sintra®, Coroplast®, MDO, plywood, aluminum, and many other substrates. It can handle rolls up to 9.84 inches in diameter that weigh up to 250 pounds. It can print on rigid materials up to one-inch thick.